The Okanagan Rail Trail bisects the park near the water, providing easy walking or cycling opportunities north and south along Kalamalka Lake. Please note that parking is limited during the summer months and those accessing the trail are asked to consider using the Regional District parking lot above the Park, off highway 97. There is still limited shade in the campground, although lake breezes cool the campground in the evening. As a result of this Kekuli Bay is becoming on of the most sought after parks in the region as many visitors are discovering the picturesque, tranquil spring and fall months where they can enjoy the manicured grounds and view while soaking in the warm Okanagan sun. Campsite reservations are accepted and a few first-come, first-served sites are also available. 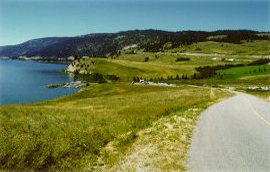 The park is located 11 km south of Vernon, off Highway #97, and on the west side of Kalamalka Lake. The park boundary is 2 km from the Hwy 97 turn-off and the campground is 1 km beyond that. The highway turn-off is well signed. History: Established as a park on March 8, 1990. Cultural Heritage: The park name “kekuli” was chosen from submissions by local school students who participated in a name-the-park contest. Kekuli refers to semi-subterranean homes built by Interior Salish natives. There is evidence of kekuli pits, and other First Nations use in the park. Conservation: The grasslands surrounding the campground provide habitat for field mice and other food sources for raptors like the red listed Prairie falcon. There is a nest platform north of the playground visible on the drive into the park. Also found in the park is the blue listed Western rattlesnake and two red listed plants, Bluebunch wheatgrass and Black cottonwood. Canoeing/kayaking is permitted on Kalamalka Lake. Please obey all posted speed and vessel restrictions. Daily kokanee quota is 2. Anyone fishing or angling in British Columbia must have an appropriate licence. There are 2.6 km of gravel walking trails through the grasslands around the campground. The terrain is gently sloped. For your own safety and the preservation of the park, obey posted signs and keep to designated trails. Shortcutting trails destroys plant life and soil structure. There are no lifeguards on duty at provincial parks. The swimming area is rocky, use caution due to proximity to active train track and boat launch. Kekuli Bay is a boater’s destination. Kalamalka is a very popular lake for waterskiing. The boat launch was heavily used even before the creation of the campground and day-use areas. The whole campground has fantastic views of Kalamalka Lake. There are benches located by the playground that also overlook the lake. In addition, there are some bird watching opportunities, especially in the spring and fall. The boat launch is located on a rocky point and is open until the first snowfall. The ramp is double-lane concrete that gets deep fairly quickly. There is also a wharf. Access is across the decommissioned CN railway line which is in the process of being converted into a trail corridor. Please be cautious when crossing as it may be being used by trail enthusiasts. There are two large parking lots. There are two pit toilets by the parking area. Please note that on weekends during the summer parking is at a premium. Cold water taps are located throughout the park next to the flush toilets. Taps are shut off during the off-season. Kekuli Bay Provincial Park offers 4 vehicle accessible campsites (#70-73) with electrical hook-ups. These small, paved sites are located in the overflow area and offer both 15 amp and 30 amp service with a standard RV receptacle (NEMA TT-30). Each site has its own picnic table, but the sites share a common fire pit. These sites are reservable. There is an additional electrical service charge of $8/night for these sites (whether the power is in use or not). A day-use/picnic facility is located just off the boat launch parking area. The large, open lawn area overlooks the lake and the boat launch. There are four picnic tables on cement pads, two with BBQ attachments, and one freestanding BBQ. The lawn is level and surrounds an adventure playground. There is no shade. The park has mostly flush toilets; however, there are also a couple of pit toilets located throughout the park. This park has a playground area surrounded by irrigated grass and features a plastic, multi-level playground with two slides, climbing poles, and a small obstacle course, among other features. There are warm showers at this park. The shower building has a men’s and a women’s side. Each side has two sinks with nearby plug-ins, one toilet, and two shower stalls with small change areas. There is one payphone at the shower building; it is lit by a small streetlamp. This park offers vehicle accessible campsites including 4 large double sites. The campsites are arranged in three terraced loops to give all sites an unobstructed view of the lake. The sites have large gravel pads great for big RVs. Irrigated lawn landscaped with young trees and a variety of shrubs separates the sites. There is natural vegetation between the different terraces. Reservations are accepted and first-come, first-serve campsites are also available. BC Senior’s Rate (day after Labour Day to June 14 only): $16.00 per senior party/night plus $8.00 electrical/night = $24.00/party/night. Read the User Fees Policy for information on Senior Camping Discounts. There are eight walk-in campsites available. Located in a shared grassy area, each site has a picnic table and can accommodate from 1-4 persons in either one large or two small tents. The fire pits are shared between the sites. The shower building in this park has a separate wheelchair accessible shower stall complete with a seat and a showerhead/hose that detaches from the wall for easier use. The lockable room also has a toilet. The toilet across from site 67 is also wheelchair accessible.